So, here's the new addition to our family. Jeep Wrangler with a snow plow nose. He's not the most handsome of boys. But he's no ugly duckling either. He has a fun personality - easy going and likes the outdoors. 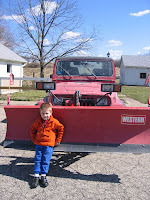 He has a fair chance of making a good living by offering snow plow services. And he'll be a big help when it comes time to haul the boat to the lake. He's a bit of an extrovert - likes to take his top off and feel the wind in his hair. But don't we all?! Err, maybe not. Anyway - Mike and Tatjana arrived back from Connecticut this afternoon after driving up there to pick up the Jeepster (purchased on eBay). The boys and I had a great time together on our own - at the movies, grocery shopping, dancing in the living room to really really really loud music and kinda sorta doing some housework.